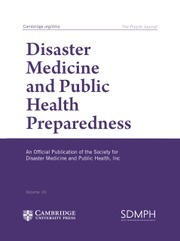 Disaster Medicine and Public Health Preparedness is the first comprehensive and authoritative journal emphasizing public health preparedness and disaster response for all health care and public health professionals globally. The journal seeks to translate science into practice and integrate medical and public health perspectives. With the events of September 11, the subsequent anthrax attacks, the tsunami in Indonesia, hurricane Katrina, SARS and the H1N1 Influenza Pandemic, all health care and public health professionals must be prepared to respond to emergency situations. In support of these pressing public health needs, Disaster Medicine and Public Health Preparedness is committed to the medical and public health communities who are the stewards of the health and security of citizens worldwide.